Yesterday our duty officer responded to a smoldering log at the parking lot at Little Trib. Someone had put out a cigarette on the crispy dry red cedar log that marks the parking area. A nice on-shore breeze fanned the embers and it spread into the log. Little Trib Parking area. The red arrow marks the log that was smoldering. Right beside the log is a metal can for disposing of cigarette butts. On the other side of the log is a quarter acre of dry grass. Downwind of the log are really dry scrubby beach shrubs and four homes. When I visited the site today I found 6-8 cigarette butts that looked less than a week old in the grass. 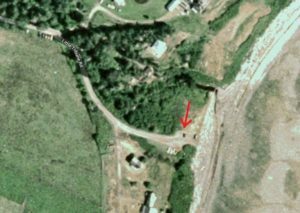 Little Trib beach access is highways land and it is legal to smoke there. However, those logs at the edge of the parking lot border on very dry and flammable private land. Please, if you use that log for a get-together or for just enjoying the view use the metal can for your butts. Perhaps consider moving down onto the gravel beach when smoking. That way if an ember falls onto the ground it won’t light up the dry grass. Also please let others, who may not be following social media, know the importance of being safe with cigarettes.